Authors: G. Witzel et al. The Galactic centre object G2 has generated some debate in recent years, including several articles right here on astrobites, about what precisely it might be. In its discovery paper in 2012 it was identified as a three Earth mass cloud of gas, but this identification proved to be controversial. It required that the object was formed around 1995, or else the gas would have dissipated before observation; however, 1995 is uncomfortably close to the time at which it was first observed. For the object to be older than that it must have a central stellar object, hidden by the gas and dust surrounding it, which can keep it bound. When astrobites last featured this object, in 2013, the question was unanswered. In 2014, Witzel et al. gave it an answer. In March 2014, G2 reached the closest point in its orbit of the super-massive black hole at the centre of the galaxy, Sgr A*. This was the time that researchers involved had been looking forward to. If G2 were a cloud of gas, it would be distorted by the gravity of the black hole, and much of its gas would fall onto the black hole. If it contained a hidden stellar object, it would retain more compactness. G2 is a difficult object to observe because of its proximity to the black hole. Observers must first find a way to separate G2’s emission with the light associated with the black hole. The brightness of Sgr A* is quite variable. However, its colour – the difference between its magnitudes at different wavelengths – is constant. To make use of this knowledge, the team took measurements of the object in two different infrared wavelength ranges, L’ and K’, using the Keck II telescope in Hawaii. In the K’ range, they expected the light from Sgr A* to be completely dominant, while in the L’ range they expected to measure a combination of light from both Sgr A* and G2. They were then able to use their K’ measurement of Sgr A* to calculate the contribution of Sgr A* to the L’ measurement and subtract it, leaving only the brightness of G2. The team made these observations during the point of closest approach in March, and over the following five months. 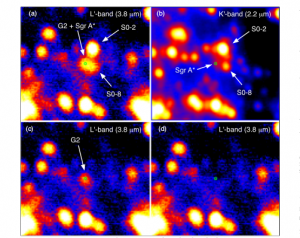 Figure 1: The disentangling of emissions from G2 and Sgr A*. Figure (a) shows the combined emission of both in L’. Figure (b) shows the emission of Sgr A* in K’, from which an estimate of its L’ emission can be obtained. Figure (c) shows the L’ data again with the estimated flux of Sgr A* removed. Figure (d) shows the residual that is left when estimated fluxes of both Sgr A* and G2 are removed – a clean result, as seen here, should imply a good estimate of G2. The position of Sgr A* is denoted by a green circle. Figure 1 from Witzel et al. Over those five months, the team measured no change in the radius of G2 – it kept a constant diameter of 260 AU [Update: This is only an upper bound on the size of G2, as the source is unresolved; see G. Witzel’s comment below]. The measured magnitude of 13.8 was also consistent, not only across all of the team’s measurements, but with all historic measurements of G2 since its discovery. Its motion remained consistent with a Keplerian orbit. In other words, G2 showed none of the disruption that would have been expected if it were a body of pure gas, and the team concluded that some hidden stellar object must be there. Figure 2: Figures (a) and (b) are radial plots of the flux of G2 in March and August, respectively. The radius of G2 is fully consistent between the two measurements. Figure (c) shows the photometry of G2 over the last decade, with the individual measurements from 2014 shown in the inset. All magnitudes seem to be in agreement. Figure 2 from Witzel et al. The team then tried to determine what the hidden object might be. From their measurements, the team were able to conclude that G2 is being heated internally, and were able to model the brightness and radius of the object that was doing the heating. Its brightness was found to be some thirty times that of the sun, consistent with a main sequence star of twice the solar mass. However, the modelled radius of the hidden object was 2 AU, a factor of 100 larger than would be expected for a star of that mass. Before the existence of the object was confirmed, there had been several ideas for what it might be. Only one was consistent with these measurements. Witzel’s team therefore concluded that G2 is the product of a merging binary system, forming a star whose radius is extended much more than usual. Over time this object should collapse until it appears more like a typical star, albeit still surrounded by the gas cloud. An interesting follow-up question is how common this process might be near the Galactic centre. It has been suggested that gravitational interactions with the black hole might make mergers in close binary stars much more common, and hence that a significant fraction of stars near the Galactic centre may be products of such mergers. The distribution of binary systems near the Galactic centre is as yet too poorly determined to say how plausible this theory is, but further investigations are underway. Mealtime for Sgr A* Gas to Black Holes: Direct formation of a supermassive black hole in galaxy mergers “Your heart sounds just fine, PSO J334.2028+01.4075” Honey, it’s an Intermediate Mass Black Hole this time! A minor correction in the article. Originally G2 was thought to be of 3 Earth mass, not 3 solar mass. You’re quite right, my mistake. I will correct it. Matthew, thank you for covering our paper! I just wanted to make one comment: we determined an upper limit for the size of G2 in L’, we did not measure the size. The source remains unresolved, and 260 AU is a very conservative value. The continuum component is actually much smaller. Gunther, thank you for reading, and thank you very much for the feedback. I will add a note in the article.